Internal parasites in dogs affect poodles but measures exist to treat and eradicate them. Signs of parasites include losing weight, coughing, exhaustion, diarrhea and weakness. Dog roundworms are the most common. Puppies have them in their bowels at birth. They're also ingested by eating dirt or infected feces. Roundworms in dogs infestation causes vomiting, diarrhea and stomach problems and may injure the liver and the lungs. Tapeworms in dogs are caused by a dog eating a flea. They live in the intestine and can prevent your pet from absorbing nutrients. Hookworms in dogs are caused by ingesting infected dirt or feces. They also live in the intestine. They cause diarrhea with blood and weight loss, anemia, weakness. It can be fatal to puppies up to 8 weeks old. Whipworms also live in the intestine and cause diarrhea with blood and weight loss. Your pet ingests these from soil and grass. Heartworms in dogs are caused by an infected mosquito bite. The worms live in the heart and cause cough, trouble breathing, exhaustion, and weight loss. 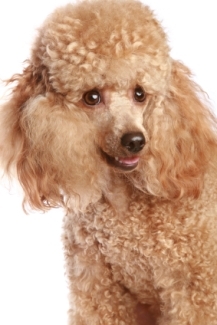 There are pills and chewable heartworm meds that you can give to your poodle every month. Some people give heartworm meds every other month or every 3 months so as not to give a medicine to their poodles every month that contains toxins. Threadworms are common in hotter climates in the southern part of the U.S. It causes bloody diarrhea and pneumonia in dogs and can cause serious illness in humans. Always use a poop scoop, shovel or gloves on your hands to pick feces, never use bare hands. If you notice signs of parasites, call your veterinarian. Internal parasites are not pleasant and prevention should be taken to keep your dog from getting infected. Puppies will get sick just like babies, and being proactive in your poodle's health will help keep disease away.